COMPASSIONATE CLIMATE ACTION: 46 Days - How Can We Afford the Conversion to a Veg World? 46 Days - How Can We Afford the Conversion to a Veg World? Extreme is good, because it's only extreme measures right now that will give us a chance at safeguarding the future. There are a lot of people out there who either don't realize this, don't want to realize this, or realize this and don't have it in their hearts to go ahead and take extreme measures. If people truly understood that "extreme" measures could save the future for their children and grandchildren, would they not take them? Would they not make the "sacrifice" of giving up meat to give their progeny a chance at a safe climate? Maybe they wouldn't. But let's tell them the truth about the urgency of the climate change emergency so they can at least choose whether to fry their children or not. The other point this commentator made was that making the switch away from livestock farming would be quite costly for farmers, and therefore politicians would balk. 1. It's cheap compared to killing the future. 2. The industry is already highly subsidized in many developed nations. Quit subsidizing and farmers might switch to more sustainable farming practices on their own. 3. 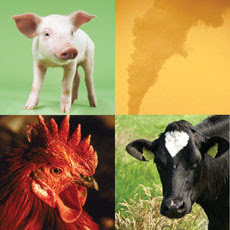 The environmental and health impacts of the livestock industry are huge! If those in the business had to internalize the costs (of water pollution and greenhouse gas emissions, for example, and the health care costs of obesity, cancer and cardiovascular disease), then meat would become so expensive that most people wouldn't buy it (at least not often) and farmers would turn to growing something more lucrative. 4. A carbon tax applied to the livestock industry (it's responsible for a HUGE proportion of the greenhouse gases that are dooming the future) would also make meat too expensive for every day consumption, again helping farmers decide to move into another type of farming. 6. You know how much countries like the US and Canada are spending on their useless invasions of foreign countries? Take some of that money and redirect it to the livestock producers instead, getting them to switch to sustainable organic agricultural practices (or retire early). If we're going to go into debt for stupid reasons, why not go into debt for a reason that will give our children a chance at a future — I bet that's a debt they'd be happy to pay off, just like today's Brits have just recently paid off their debt from the Second World War. I'm no economist, but I can recognize a fighting chance when I see one. Getting off the meat habit (Gandhi called it a superstition of the British) could drop anthropogenic methane emissions 37%! That's huge! Methane is so scary as a greenhouse gas that lowering it at all will be great, but almost 40%, wow, that would be a true gift to all future generations, of all species. Industries come and go. Lots of jobs that existed a hundred years ago no longer exist. The livestock industry's time is up, and those workers will surely be assimilated into new, more sustainable employment (or, ahem, put out to pasture). It's a win-win all round.